Directions on getting to the Tang Center (Building E51) parking lot are below. 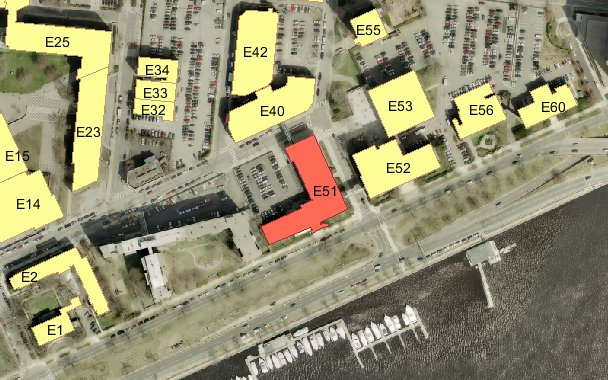 E51 has a small parking lot in back, and the back entrance leads into the first floor. Enter the building through the parking lot entrance, and follow the corridor to the left. There's an elevator at the end of the short corridor, on the right. Take this elevator to the third floor. When you reach the third floor, follow the corridor to the right, past the men's room, and then all the way to the end. Room 395 will be on your left. NOTE: As of June 2017, MIT no longer allows cars without a valid MIT parking sticker to park in MIT lots, not even after hours. Additionally, on-street parking at meters is no longer free after 6:00 pm. Take the MBTA Red Line to Kendall Square. If you came from the north (Harvard Square, Alewife, etc), take the stairs up to the Main Street and turn right towards Wadsworth Street. if you came from the south (Park Street, Ashmont, Braintree, etc), walk across the street and turn left toward Wadsworth Street. Follow Wadsworth Street to Amherst Street. Building E51 is on the corder of Wadsworth and Amherst. From the south: We recommend parking at the Quincy Adams parking garage and then taking the MBTA Red Line to the Kendall Square station. From the north: We recommend parking at the Alewife parking garage and then taking the MBTA Red Line to the Kendall Square station.